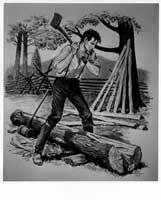 Description: Young Abe Lincoln the rail-splitter in 1830 as he chops out center of a split log that did not break clean. Art depicts Abe swinging the ax. Other tools, along with rails and a rail fence are in the picture.